Lately, I’ve added a check of baseball-reference.com’s “players born on this day” page to my morning rituals. Today, July 26, now four days beyond my wife’s due date, offers some interesting baseball birthdays. Perhaps the most peculiar career to ever lead to induction into the baseball Hall of Fame got its start on this date in 1922 when knuckleballing journeyman reliever-turned-starter-turned-reliever Hoyt Wilhelm was born. Wilhelm did not even reach the majors until he was 29, surely the oldest rookie besides Satchel Paige to ever wind up in Cooperstown. He lasted until he was 49. If any prediction about the life of someone born on this date could be gleaned from the most accomplished baseball player to be born today, it would be that life is strange and beautiful. On Sunday my wife and I went to the beach near our house. There was some kind of large Hare Krishna gathering going on in the park bordering the beach. We walked past it and put down our folding chairs on the sand. Oddly, no one else was around. I walked over to ask the lifeguard, a teenage girl, what was going on, and she said that heavy rains a couple days earlier had caused raw sewage to spill into the lake, and she was waiting to hear if the beach would be closed or not. I walked back, and Abby and I sat there and watched a seagull pick at something slick and rubbery that once was alive. The music of the Hare Krishnas wafted intermittently over the beach, along with the groans of a garbage truck and the sound of the little waves of Lake Michigan. Eventually, a green flag was raised on a pole beside the lifeguard chair, and people here and there began appearing on the beach and wading out into the water. “My dream was to sit with my feet in the water,” Abby said. This is the kind of dream that seems manageable. Other dreams have side effects. But this one: easy. We picked up our chairs and moved down to the water and sat and let the ends of the little waves wash over our feet. The sound of the water was now all we heard. We ate Pringles and stared out at the water and made each other laugh. Jumpy Jittery Jaundiced Josh Wilker relaxed. Other notables born on July 26 include Norm Siebern, the date’s leading hitter, key part in the trade that brought Roger Maris to the Yankees, and bit player, at the end of his career, with the 1967 Impossible Dream Red Sox; Ellis Kinder, tireless country boy Red Sox hurler from the team’s late 1940s-early 1950s excruciating bridesmaid years; and Sibby Sisti, who despite or in part because of his underwhelming hitting skills served as the cleanup batter in one of the greatest baseball books ever written. On the way back from the beach, I felt very tired, as if instead of sitting in a beach chair with my feet in cool water I had crossed over to Michigan and back doing the Australian crawl. I think most of the time I live as if I’m braced against an invisible but somehow crucial wall that seems as if it will crumble down and let in all manner of ruin if I let up for one second. It’s exhausting. Probably pretty stupid, too. There’s nothing you can do anyway. No wall to hold up I mean. Ruin, chaos, it’ll just come. Other things will come, too, good things, but probably if you’re spending all your time and strength bracing against a nonexistent wall you might miss it. John Knox is like most of the baseball players born on this date. He played for a little while, didn’t really attach himself to any particularly significant moment in baseball history (though he did appear in a game in which Hank Aaron set the career record for RBI), and then moved on to other things. He was not a bad player, at least as far as his stats show, his .274 lifetime batting average one that most players would be proud of, especially if they were, like Knox, utility infielders, who usually spend their solitary, poor, nasty, brutish, and short major league existences foraging for enough basehits to push them over the Mendoza line. It’s actually a bit of a mystery why Knox didn’t stick around any longer than he did. He even looks confident in this 1976 card, his last. 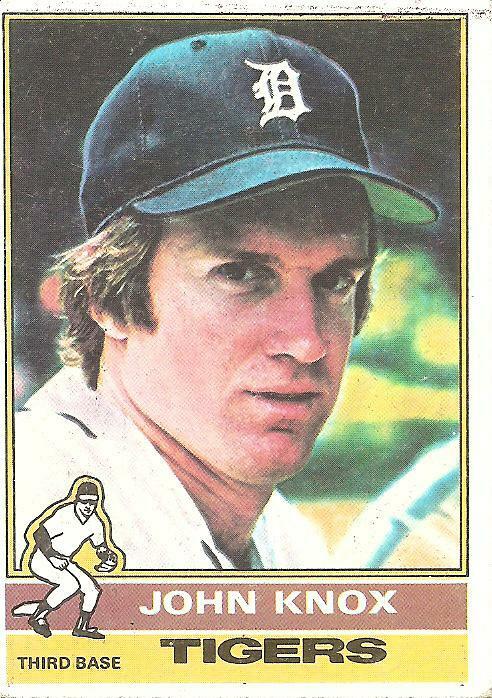 The Tigers sold him to the Reds early in 1976, but he never cracked the major league roster of the reigning World Champions, who were with Joe Morgan and Pete Rose about as covered at second base and third base, Knox’s two positions, as any team ever has been. Knox knocked around in the minors that year, hitting poorly, and that was that. Occasionally a player who skirts across the margins of the majors will for some reason or another impress himself on the collective memory of the game. But most guys who play the game are just names with dates and numbers attached to them. Still, they had their day. They got to move their chair down close to the water and for a little while live a dream. You are currently browsing the archives for the John Knox category.